It's natural for us humans to worry about "our" birds when we're going to be gone for a few days. "What are the birds going to do??? ", we ask. I assure you, they'll do just fine, but if you want to provide some foods that will last for the longest period of time after you leave, I do have a few suggestions. When we're leaving home for a few days, our #1 go-to birdfood is large birdfood cylinders. Cylinders are made of a variety of seed and nuts, and some even have suet or fruit in them (with absolutely no fillers). The ingredients are compressed and held together with gelatin to form a round cylinder. Large cylinders weigh over 4 pounds each, and they last longer than a comparable four pounds of loose seed in a hopper feeder. When placed on a cylinder feeder with both a cover and a tray (to keep the cylinder dry and catch pieces as they break off) and on your squirrel-proof Advanced Pole System set-up, a group of cylinders will often last for many days into your absence. The Cylinder Cafe feeder with its large cover and ventilated tray is ideal for large cylinders. To add even more cylinders to a vacation buffet, I take the hopper feeder off the top of one of my Advanced Pole System set-ups, replace it with a double crook, and hang two more cylinders feeders. When I return home, I switch back to the hopper feeder. This flexibility is one of the many advantages to the WBU Advanced Pole System! To provide suet while you're gone, a suet cylinder works well and lasts longer than a small suet cake. Below is a suet cylinder being enjoyed by a Rose-breasted Grosbeak. You can also put a suet cylinder in a WBU Dinner Bell feeder (pictured below with a small cylinder) that lets you lower the cover to exclude larger birds. 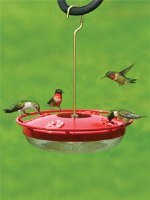 Our Eliminator Squirrel-proof birdfeeder holds a lot of seed (3 quarts) to last many days into your time away. Squirrels are not eating away at the seed, so all of it is for your birds. It has weight-sensitive perches, so if you want to exclude larger birds, you can make the adjustment and the seed will last even longer. We fill ours with safflower seed, which the Purple Finches and grosbeaks love, but the Blue Jays don't prefer. That helps the seed last longer! Now depending on how long you're gone and the availability of natural food sources, your results may vary, but these are the strategies I use to feed the birds as long as I can while I'm away from home. 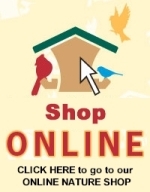 Now you can enjoy your vacation and not worry about your birds!!! Daily is not too often! But if you don't change it daily, change it every 3-5 days. If temperatures are high or the feeder is in the sun, change it more often. If the nectar is cloudy or if you see black spots, change it. Make sure the feeder is squeaky clean each time you refill. Any mold or bacteria left over from previous fillings will taint the new nectar and it will go bad fast. Do not add fresh nectar to old nectar. If possible, hang the feeder in a shady spot. Nectar in feeders in the sun will go bad faster. If a shady spot doesn't work for you, try a rain/shine guard over the feeder. If you're throwing away a lot of nectar, don't fill the feeder full. Q. Can dog (or cat) fur be used for nesting material for the birds? A. Some birds use animal fur they find in nature to line their nests. It provides a soft surface for the nestlings as well as acting as an insulator from cold and wet. You can help those birds by providing fur from your dog or cat. By doing so, you might help their nesting success as they conserve energy by taking advantage of an easy source of animal fur. However, you should not use any type of animal fur that has been exposed to flea or tick treatments. This conversation actually took place. The names have not been changed to protect the innocent. A few days after the chickadee eggs in one of my nest boxes hatched, I took this picture during a NestWatch visit and then posted it on Facebook. Things got interesting when Facebook friend Peg questioned what the hatchlings were laying on. Peg: Sweetness-what does their white bed consist of Nancy? Me: Interestingly, the nest material that was on the bottom when there were eggs has been moved and they're actually on the floor of the box. The nestbox is made of PVC plastic which makes it kind of slippery on the bottom. The base of the box is also larger than the 4" x 4" that is typically recommended for chickadees. The beautiful cup that the eggs had been nestled in was gone and all the nest material had spread out, revealing the hard floor of the box. Good thing Julie Zickefoose was hanging out there in Facebook-land. The author, naturalist, and wildlife rehabilitator saw a problem and jumped into the conversation. Julie: Nancy, I'm worried that those babies are on the bare hard bottom of the PVC box. Sometimes chickadees can get a little too enthusiastic with their deep tunneling. If this were my box, I'd take them out, borrow some nesting material from the tall soft sides of the nest and pack it tightly on the box floor, to put it under them STAT. They can get permanently spraddled limbs from resting on such a hard surface. Science Chimp, checking out. Eee! Eee! Eee! The Cornell Lab of Ornithology NestWatch Code of Conduct makes it clear that you cannot handle or touch the birds in any nest you're monitoring. I'm a stickler for rules and know why those rules and laws exist. And I'm not one that believes that rules are for someone else or that I'm immune to them. So I had a dilemma: handle the birds without the proper permit so I could give them the greatest chance of developing correctly, or adhere strictly to the law and let them be, risking the possible deformity of 6 little chickadees. I decided I had to step in. With the help of another adult, we gently tipped the box to move the hatchlings into a pair of cupped hands. Though it was warm outside, we closed those hands around the birds to help retain the heat in their tiny, naked bodies. Working quickly, I rebuilt the nest by replacing the moss over the bottom of the floor, used my fingers to create a new cup, and put in some additional alpaca fiber to line the cup with. We placed the babies back in the cup and closed the box. The entire operation probably took less than a minute. We then left the area to observe from a distance as momma chickadee, who watched the entire ordeal, returned to the box. My heart was beating so fast! We had just held those 6 little babies and hopefully had changed the course of their lives. I excitedly reported back to Julie on Facebook. Me: Dr. Julie, I responded to your Code Red and put a nice layer of moss with alpaca on top back under these little nestlings. Hopefully the 5 days they spent on the floor will not have a permanent effect on their development. THANK YOU SO MUCH for the advice. The power of Social Media works again. I can't thank you enough. Another friend watching the conversation weighed in, followed by Julie's response. Lynne: You all warm my heart. Julie: Knew you'd hop to it Dr. Castillo! But alpaca? Didn't you have any Russian angora? Because chickadees are known to have champagne tastes and Budweiser budget. So here's a picture of those 6 little chickadees a day before they left the nest. I was able to see a couple of them make their first flight and thankfully everything seemed just fine. Now, the last thing I want to do in telling this story is to give the impression that it's okay to handle wild birds. But with expert guidance, and swift, careful actions - with the birds' well-being as the top priority - I feel we were able to make a positive difference in those chickadees' lives. In closing, I would again like to offer Julie Zickefoose my sincerest gratitude for helping us help what I consider "my" birds. This post is a tribute to Julie who best summed it up in her final Facebook comment that day, "All for the birds and birds for all!"